Let’s leave magical powers out of this, though. I want to talk about the sort of levitation achieved by science. Humans have found a handful of ways to force objects to defy gravity, and I’m going to tell you about one: magnetic levitation. Ever heard of a maglev train? It uses electromagnets to run without touching the tracks, cutting down on friction (allowing for faster starts and stops) and wear-n-tear (theoretically making it less expensive to maintain). In order for this to work, the train has to hover at exactly the right distance from the track: 15 mm. That’s about the width of a woman’s thumb. The downside? No more nostalgic penny-smushing (possibly outweighed by the cool factor of a LEVITATING TRAIN). Some maglevs actually use electrodynamic levitation, which involves superconducting electromagnets. Whoops, sorry…looks like the Too Many Fancy Scientific Words (TMFSW) alarm just went off. Let’s break this down a bit. It’s a magnet that uses electricity to produce its magnetic field. What is a superconducting electromagnet? An uber-strong electromagnet produced by electric current from superconducting wire. Yeah. It just means the wire, when brought to extremely low temperatures, can carry a bunch more electrical current than regular wires. This allows it to create really strong magnetic fields. Is everybody good? Can we turn the TMFSW alarm off now? Excellent. Now, where was I? When you think about how heavy a train is, it makes sense that these magnets would have to be outrageously strong to levitate one. 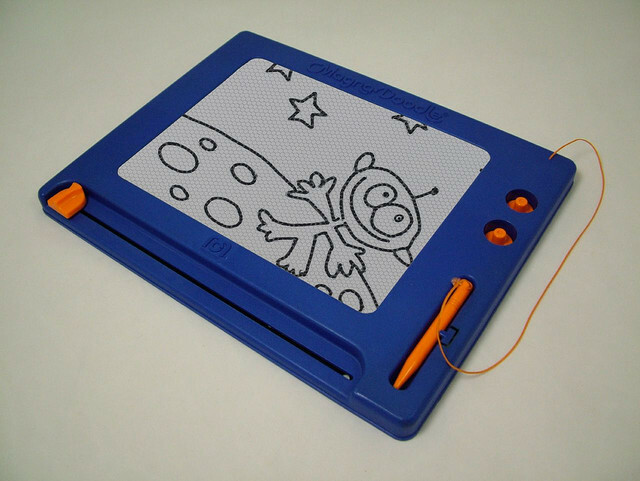 Thus, superconducting electromagnets instead of, say, Magna-Doodle dust. Fine. Just watch this video. If you’re not in awe of levitation after that, we’ll see about resurrecting Kellar for one last show. People are perpetually at play. Here are a few pretty pleasing pastimes, from the plain and prosaic to the positively peregrine. The point of planking is to lie horizontally, face-down, with both hands by your sides and legs out straight, on random surfaces. Actually, technically that’s the method of planking. The point is…well, no one really knows what the point is. But apparently a lot of people find it a worthwhile way to pass the time. See? 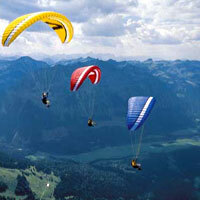 Paragliding is very similar to hang gliding, except that the glider has a parachute-type wing called a canopy instead of the stiff, structured wing of a hang glider. Both types of gliders are motorless. Paragliders move more slowly than hang gliders. To go paragliding, a pilot sits in a harness that is connected to the nylon canopy by a series of cables (lines) and carabiners. Takeoff occurs when an updraft inflates the canopy (very dramatically named the ram effect) and allows the glider to ride on the wind. The pilot tugs on control lines to brake and shifts his/her weight in the harness to steer. Remember those T-shaped wooden propellers you twist between your palms and let fly? Those are puddle jumpers. You can still get them here. Also? There’s actual jumping in actual puddles. This game was designed to make middle school bearable. Creating the paper football is just as much a part of this game as the actual playing, and most school cafeteria tables are the perfect width for use as a paper football field. One sheet of notebook paper folded into a tight triangular packet serves as the ball. Two players sit across the table from each other with the ball in the middle. Players take turns giving the ball one scoot toward the other player. After a touchdown, the defending player creates uprights with his/her fingers at the edge of the table, and the other player attempts the extra point by propping the ball up on its corner with one finger and flicking it toward the goal. Play ends when the lunch bell rings. This party game seems like an early version of Spin the Bottle. A group of people (teenagers, presumably) sends one person out of the room. That person then knocks on the door. The group chooses someone to answer the door and pay for the delivery of a “letter” (i.e., nothing) with a kiss. Postman’s Knock is also a stick dance in the Morris style, a form of English folk dance that may date back as early as the late 15th century. Nothing can put on smile on my face quite like a bunch of grown men in costume dancing with unbridled exuberance. Wanna see? 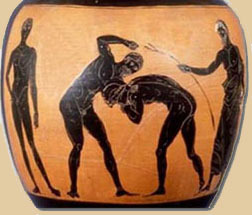 Incidentally, pankration is still around. From what I can tell, the only requirement for participation is that you have more abdominal muscles than danger receptors.